Here’s Real Horses for Courses! I suggest that cars are only second to the weather when it comes to general conversation and when there is some positive weather, be it good or bad, then it influences the motoring topic to a great degree. No more so than with the recent blanketing of snow across most of the British Isles, the over the dinner table conversation strongly focussed on suggestions on how to keep mobile. 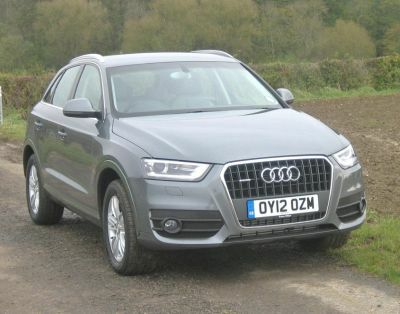 My opinion was sought on the merits of various SUV all-wheel drive models suitable for narrow rural roads and I recalled my original experience with a turbo-diesel powered Audi Q3 tested in the previous bout of snow though, before giving my advice, I based my opinion on what use the vehicle would be put to. In a particular case the user only did 5,000 miles per year and a lot of that was very short journeys i.e. to shops or a nearby school, distances that did not give the vehicle’s system sufficient time to warm up. Thoughts of Diesel Particulate Filters (DPF) having to be replaced at great cost under these driving conditions made me come down in favour of one of a pair of petrol fuelled versions of the Audi Q3; here I report on the least potent one rated at 170 ps/168 bhp that I found offered good all round performance and only lost a little in overall fuel economy to the diesel model. Bear in mind, petrol in the UK is cheaper than diesel. With SUV cross over models now accounting for around 10% of UK new car sales it is patently obvious that the concept is a popular one based on a number of factors that obviously include a wish for a different type of vehicle that has the practical aspects of a hatch back, strongly distinctive styling, easy/enjoyable driving characteristics and the potential to survive on road and also cope with the rough stuff. Above all, the SUV concept is nowhere near as cumbersome as a full blown 4x4 - I recall encountering a pair of the latter travelling in opposite directions on a narrow snow covered road that could not pass each other. So big is not always beautiful! That’s the thing about the Audi Q3, its ‘footprint’ is about the same as a conventional medium sized car, the interior space provides generous occupancy for five adults while load capacity is close to that of a medium sized estate car though the loading platform and the tail-gate lip are a tad higher. That turbocharged petrol engine? The very mention might appear a bit daunting, particularly to those accustomed over time to the sympathetic flexibility of a diesel engine, but I can genuinely say that this type of petrol engine has come on leaps and bounds in recent years and there is an abundance of power but with no fireworks and the power band is exceptionally wide and flexible. Additionally, the ability of this engine to rev higher makes for a more sporting drive, the car feels lighter all round, not only when performing but to drive. Somewhere sneaking into its DNA there is a touch of a hot hatch back. Admittedly, I found the ride a bit busier on certain surfaces than I recall with the previous test though this one had Pirelli tyres compared with the other car’s Continentals. To all intents an purposes I found Q3 an easy cars to drive (access to the driving seat is easy despite the slightly raised ride height) and the controls are very responsive, the 6-speed gearbox positive and smooth in action and with well chosen ratios to complement the engine’s power characteristics. Brakes are smooth, the fuel/emissions saving Stop/Start system responsive rather than intrusive and the road grip 100% assuring - all achieved at refined noise levels. Audi claim a top speed of 132 mph with acceleration to 62 mph (100 kph) in a very respectable 8.2 seconds while the combined fuel consumption is 38.7 mpg compared to 42.9 mpg for the diesel version I tested earlier. I would suggest that 35 mpg is realistic under general conditions while in the snow fuel consumption obviously takes second place to being able to actually get home in front of the fire! Whatever market sector Audi venture into, not only do they seriously research the situation but they maintain a strong premium brand standard of build engineering, finish and appointments. With demand for all its products squeezing production lines the Q3 comes out of the high-tech SEAT factory just outside Barcelona and combines an exceptionally high build quality (it comes with a 5-Star NCAP safety rating) and clearly with the interior appointments that are an Audi hall mark. A highly pleasing cockpit area is highlighted by the usual impressive instrumentation, a driving position that invites one to take up residence and an overall ambience that I suggest remains pleasing for the entire ownership tenure. For the basic purchase price it is well equipped machine though Audi caters for a bespoke buyer. Thus, on the test car the price was lifted by about another £7,000 to demonstrate the some of the items a buyer might opt for - this included leather covered sports seats, a technology package including satellite navigation, special alloy wheels, Xenon lighting, towing equipment, upgraded sound system and Bluetooth system. Yes, I doubt if any two Audis have the same specification but they all prove very satisfying and fit for purpose. I suspect that Q3 owners actually wish for a bit of snow to prove their wise decision! On road price from £25,280- as tested £32,170. The Society of Motor Manufacturers and Traders (SMMT), the UK car industries mouthpiece, has published figures for January which show a 11.9% increase for registrations in January.